Half the battle of what I do is thinking a bit differently to everybody else. I have to look at business or marketing or a web site and apply a bit of my knowledge, experience and unique perspective to see how it can benefit my clients. A few weeks back my 2 sons and I went to what’s rated as one of the best restaurants on the Gold Coast (they also happen to be one of our clients). There was a table of 4 people sitting at an outside table. For probably 40% of the time, 3 of the diners were busy on their smartphones. Now as stupid, as ignorant and as rude as using your phone is at dinner, it happens. And it seems to happen a lot. So there’s 2 things this restaurant can do to take advantage of that irrefutable fact that people very often use their phones during dinner to connect with friends. 1. Post up these handy printable signs to encourage Facebook check-ins and Likes (hat tip to the lads and ladies at iOnline for the find). That way many of the user’s friends will see the restaurant mentioned – increased awareness, branding and, to follow, sales. 2. 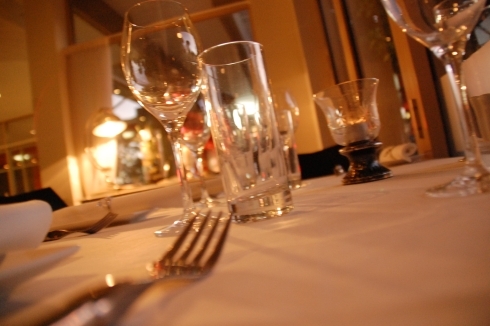 Ban phone use at the restaurant and leverage that policy via a public relations strategy. Leads to increased awareness, branding and, to follow, sales. The challenge is to ensure whatever strategy you pick fits with your brand, your marketing and your philosophy.